You know some things can come back to haunt you … and Music is especially good at doing that. I happened to be in Central London on Sunday when several city landmarks paid their own tribute to the victims of the Paris massacre. Vigils had already been held in London and around the world following the deaths of 17 police and civilians in the French capital following the attack on the Charlie Hebdo satirical magazine on Wednesday 7th. In a tribute that coincided with the rallies across France, London landmarks including Tower Bridge and Trafalgar Square displayed the colours of the French Tricolore national flag. From a photographic point of view, London’s inclement weather actually provided a nice effect with the projection being picked up by the raindrops, so I had to take the opportunity to capture some photographs …. You can’t doubt that the the internet has brought benefit and much more power to everyday life over the last ten years or so of it’s existence. I’ve been meaning to visit the Tower of London for weeks to visit this outstanding sight. Having spent a fair portion of my life in and around Bristol, I still have a great fondness for the city. The National Gardens Scheme opens thousands of gardens throughout England & Wales to raise money for nursing and caring charities. Most of the gardens are private and are not normally open to visitors. It’s that time of the year again, the longest day of the year brings the spiritual event of ‘The Summer Solstice’. Growing up in Wiltshire this event has always had a local relevance, what with the hallowed turf of Stonehenge being an international Mecca for this yearly event. Blackbirds are too noisy !! In the back garden at my Mum’s is a blackbird’s nest. It is also a frequent attraction to the local cats of the neighbourhood. …. and the volume hasn’t been tampered with, it is that loud !! This recently happened at 4am. Young blackbirds, please grow up and leave the nest soon !!! I’ve seen this happen a few times now especially at this junction – which is my nearest – and consists of four lanes merging together. Many a time I’ve seen lorries behaving errantly, only to see in the cab that the driver has a laptop perched on the dash. I just hope they catch more ! 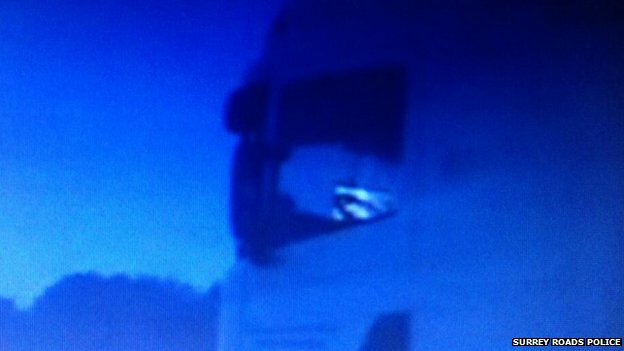 A lorry driver used Skype while driving on the M25, police said. Another driver reported seeing the man apparently watching television at junction 12 on late on Tuesday. The HGV, which had French plates, was stopped at junction 14, the junction with Heathrow Airport, where officers learned the driver had used the internet phone service. The 35-year-old man was fined £500 and is due to be reported for driving without due care and attention. Surrey roads policing officer PC Dan Pascoe, who stopped the driver, said: “We have no power to seize the vehicle and the roadside deposit negated the need to arrest the driver. “Once he had paid the fine he was allowed on his way.